This 3 day workshop is taught by the amazing artist: Dominque Medici. 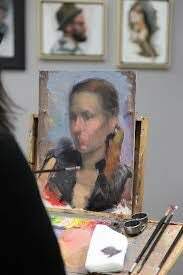 In this workshop, you will work with a systematic and disciplined technique that is uniquely designed for speed portrait painting. I didn’t even know this was a “thing” until I visited his website, but WOW! His work is amazing and his talent is beautifully displayed in his artwork. (Check it out by clicking on the picture below!) In the workshop, he will provide frequent demonstrations and also break down the process of painting into clear and consecutive steps. He will also critique and give feedback and instructions during each session. He will focus on 4 main aspects of a portrait: Proportion, Value, Color, and Edge. The cost for this three-day workshop is $375 + model fee. The workshop will be held on Friday, Saturday, and Sunday, June 8th, 9th and 10th, 2018 from 10:00 am until 5:00pm.